Each year, more than 5 million Americans take a nuclear heart stress test, which images blood flow in the heart before and after a brisk walk on a treadmill. The test allows doctors to visualize a lack of blood flow that may result from blocked or narrowed coronary arteries, which are linked to heart disease, the leading cause of death in the United States. The test is conducted with a device called a gamma camera, which also helps diagnose dozens of other conditions, from arthritis to renal failure. Invented in the 1950s, gamma cameras used two 500-pound detectors the size of truck tires and cost hundreds of thousands of dollars. As a result, they were usually located only in regional medical centers. 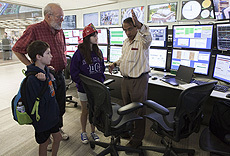 But new options are available, thanks to a small company, a national laboratory and, in part, the rise and fall of both the Cold War and the Superconducting Super Collider. The small company is Digirad, which a materials scientist started in 1985 as San Diego Semiconductors to create and develop applications for complex crystalline materials. Its name changed to Aurora Technologies in 1991 and to Digirad in 1994. Sustained by a variety of government R&D contracts, the company's most successful early product was a gamma-ray detector. In 1991, the Defense Advanced Research Projects Agency (DARPA) gave the company a contract to do more. The agency asked for a prototype portable gamma camera — a detector array with readout and display systems that could remotely determine the number of nuclear warheads contained within the nosecone of a missile. At the camera's heart were cadmium zinc telluride crystals, which converted gamma rays into electrical signals. 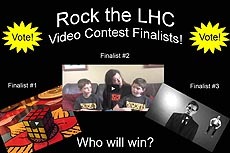 It's down to three: Vote for your favorite video finalist in the Why the LHC Rocks contest, sponsored by the University of Notre Dame. 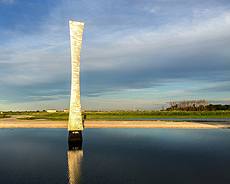 The winner will receive a trip for two from anywhere in the continental United States to Chicago and a tour of Fermilab. View the videos. 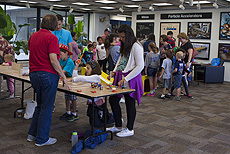 More than 250 people participated in Daughters and Sons to Work Day on Friday. In addition to watching the Mr. 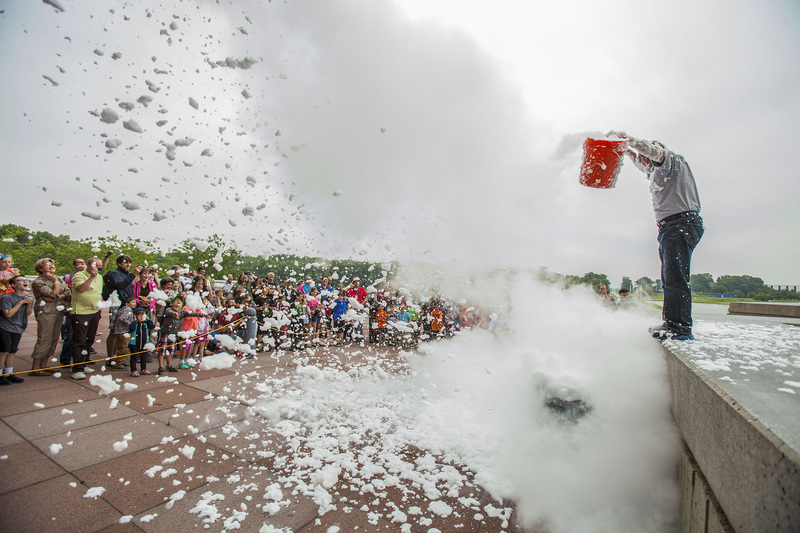 Freeze show and the Fermilab Fire Department safety demonstration, parents and their kids got a taste of the work scientists do at the laboratory. View more photos at Fermilab at Work. Some physicists actually believe that the universe we live in might be a hologram. The idea isn't that the universe is some sort of fake simulation out of The Matrix, but rather that even though we appear to live in a three-dimensional universe, it might only have two dimensions. It's called the holographic principle. The thinking goes like this: Some distant two-dimensional surface contains all the data needed to fully describe our world — and much like in a hologram, this data is projected to appear in three dimensions. Like the characters on a TV screen, we live on a flat surface that happens to look like it has depth. Aaron G. Sauers, patent and licensing agent, wrote this column. 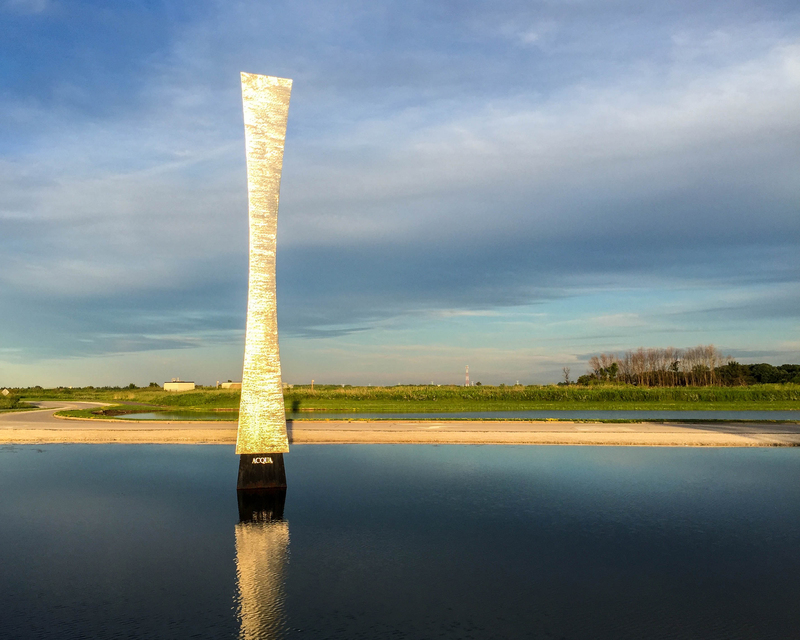 Will Fermilab technology drive the next generation in sneaker design, find its way into your next cell phone or pave the way to superior roads? 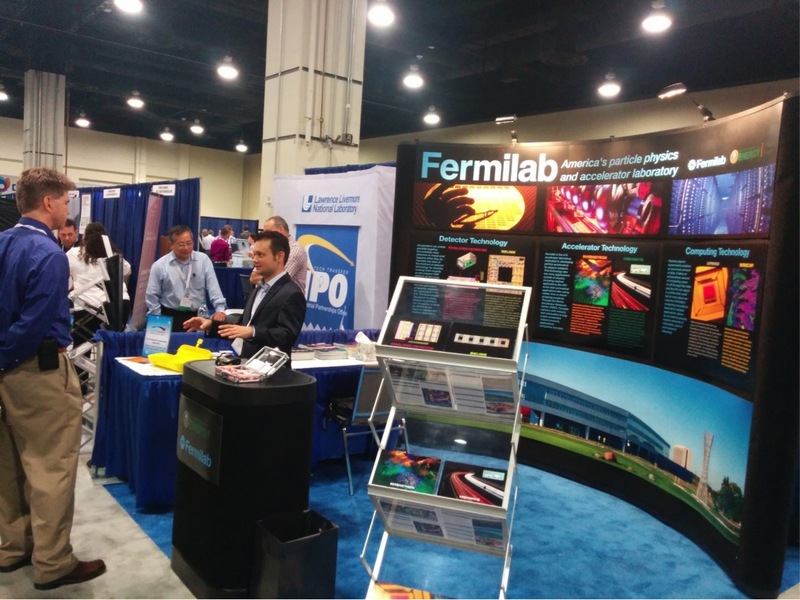 The Office of Partnerships and Technology Transfer, IARC and technical staff members represented Fermilab and its cutting-edge technologies at the National Innovation Summit and Showcase from June 15 to 19, giving industry leaders a glimpse of the future. 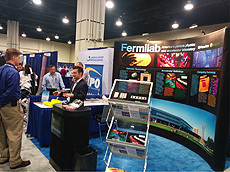 The 2015 summit took place near Washington, D.C., and was co-located with the National SBIR/STTR Conference and the TechLink World Innovation Conference and Expo. It was an excellent opportunity to meet with people from small businesses, Fortune 500 companies, and angel and venture capitalists. The event allowed for the international, policy and economic development communities to network. 1. Injection Locked Magnetron with Phase and Amplitude Control: A technology that enables use of lower-cost, high-efficiency magnetrons (devices commonly used in microwave ovens) for radio-frequency power sources, where tight vector control is required. 2. Highways: A truck-mounted electron accelerator that can be used for in situ treatment of freshly laid asphalt, turning it into a tougher, longer-lasting material. 3. Pixelated Detector: A large-area, highly segmented camera system with pixels capable of handling signals of up to five orders of magnitude of dynamic range and in situ storage of images acquired at high speed. 4. SEUSS (Single Event Upset Suppression System): A circuit latch that can be configured in a number of ways familiar to electronic engineers that is resistant to malfunctions caused by electromagnetic radiation. 5. VIPRAM: A high-speed pattern recognition system using 3-D integrated circuits. 6. WireCAP: a novel packet capture engine for commodity network interface cards in high-speed networks. Each technology was featured on the booth and on its own "technology card," which included a synopsis, the inventor's vision for the technology and its potential for market impact. Fortunately, we had our own candy (Smarties, naturally), and a 3-D-printed scale model of a compact SRF accelerator at the booth, which attracted lots of visitors and served as a good conversation-starter. Robert Kephart, IARC director and inventor of the Highways technology, delivered a presentation on compact SRF accelerators that Monday as part of the Technical Program Advanced Manufacturing track. Engineer Brian Chase gave a presentation on his Injection Locked Magnetron with Phase and Amplitude Control invention on Tuesday as part of the Business Program, Energy and Efficiency session; this invention was also selected for a 2015 TechConnect National Innovation Award. Tom Kroc, Accelerator Division liaison of IARC, presented a poster on industrial applications for accelerators in the same track on Wednesday. Jim Hoff, inventor of SEUSS and VIPRAM, assisted in detailed technical discussions with a number of companies. 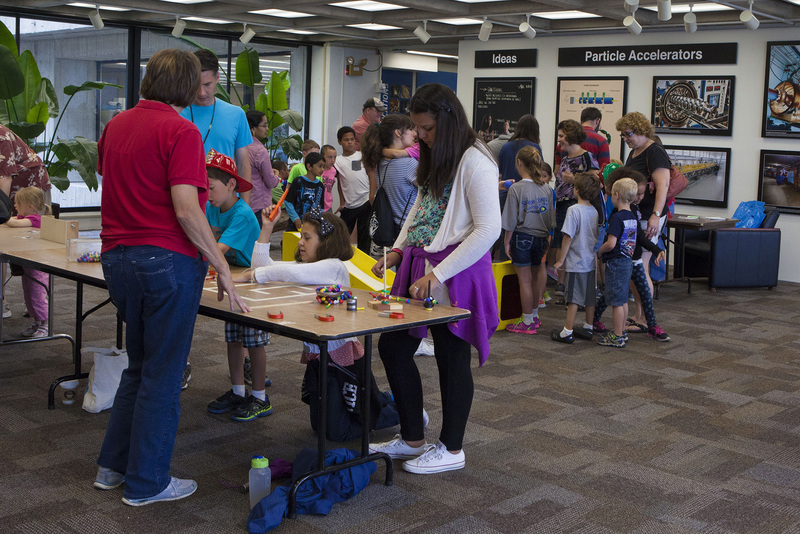 Everyone in attendance took turns staffing the booth and made valuable contacts for Fermilab. These are exciting times for our burgeoning technology transfer operation. 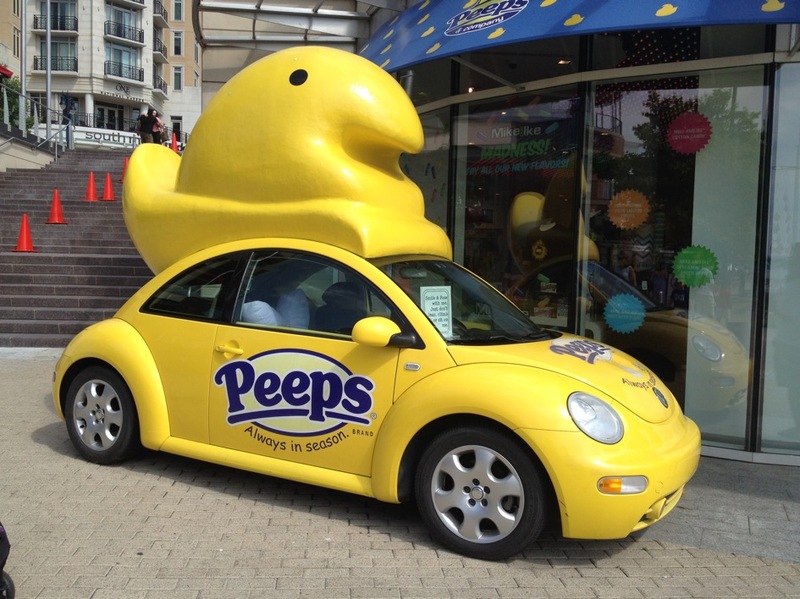 Will a little yellow Peeps mobile one day coast down a Fermilab roadway? Perhaps. Steer clear of the magnetrons, little marshmallow. Steer clear of the magnetrons. Former Fermilab scientist Elliott Treadwell passed away on June 20. Most recently a professor at Florida A&M University, Treadwell was a postdoctoral researcher and then a staff scientist at Fermilab in the 1980s. A $200m upgrade to the Laser Interferometer Gravitational-wave Observatory (LIGO) has been completed, with the facility set for observations in the coming months as it aims to be the first to detect a gravitational wave. Dubbed Advanced LIGO, it consists of two separate telescopes in the US – the Livingston observatory in Louisiana and the Hanford observatory in Washington state – that use laser interferometers to search for gravitational waves.